Dr Schultz (Christoph Waltz) is a civil man in an uncivil world, ironically a mere two years prior to the US Civil War. Despite being in the deep South Schultz harbours an anti-slavery viewpoint, but when he frees Django from chains it isn’t for such noble purposes. Schultz needs Django to identify three men that he is pursuing. Three men with a price on their heads… This is because Schultz is a bounty hunter, though to his credit he offers Django both payment and his freedom in return for his help. Django in turn states that what he wants most of all is his beloved wife Brunhilda (Kerry Washington) from who he has become separated. Schultz takes Django under his wing and treats him as an equal. In this manner he is the distinct minority. White folks find a black man riding a horse and speaking his mind shocking. They find a white man riding alongside such an ‘atrocity’ a traitor. Django doesn’t care. He is on the way to find his beloved, and along the way he gets to whip, beat and kill all kinds of white folk who dare impede his progress or indeed look at him funny. Enter rich and privileged Calvin Candie (Leonardo DiCaprio). Candie considers himself quite the cultured gent, he finds Django ‘intriguing’, though he openly detests black people and uses them as he sees fit depending on their skillset, as servants, pretty living ornaments, or for his passion – ‘Mandingo fighting’, where two black men fight to the death for the amusement and gambling purposes of whites. But Candie has Brunhilda on his Candieland Estate, therefore Schultz and Django must shelve their opinions regarding his reprehensible beliefs and concoct a devious (but ultimately unnecessary) scheme to get her back. The longer Django Unchained goes the sillier it becomes. The opening hour was full of promise and the relationship between Django and Schultz represents the best moments in the film – actually I should say that Schultz provides the best moments and the best character in the film. Once Candie appears the moments you will take away exist for shock value; the slave eviscerated by vicious dogs, the runaway slave in the ‘hot box’ and the first Mandingo fight. DiCaprio oozes menace and elicits feelings of revulsion, but this is hardly a stretch given how his character treats other human beings. If DiCaprio’s rich white bad guy routine wasn’t enough, consider Samuel L Jackson popping up as his ‘sassy servant’ Steven who Candie uses to keep the less reliable slaves in line. Steven ‘perches’ himself behind Candie’s right shoulder at all times, jabbering away like a parrot and lazily reiterating his every point like an 1800s Sen Dog. Django himself transitions from a scruffy and uneducated slave to a fast talking killing machine. I could care less about the ‘moral conundrum’, but his strutting about like a peacock and horsey tricks after a bloody battle are just pathetic regardless of who he just killed or how he did it. The dual finales – the one where they should have stopped and the one too far – scream John Woo from the rafters, which betrays the tone of the film to that point, and unfortunately between the two shootouts is an indulgent scene where Michael Parks, John Jarrett and Tarantino himself ham away and overact to buggery. The excision of this one scene alone would elevate the final rating by at least 0.5. But it isn’t all bad. The dialogue, the immaculate production and the cast are all top notch. See how many quality actors agreed to appear in roles not amounting to more than a few lines. The film is far more linear and straightforward than anything Tarantino has made since the awful Death Proof, with more violence than anything aside from the Kill Bill films. None of this will matter to the media. Quentin Tarantino knows his rep as a maverick will gain our attention. He knows what will get us talking; slaves! The ‘N’ word on endless loop. A black guy killing white folks. It just seems now that the actual quality of the film has become secondary. Scenes like the Tarantino cameo – I think he is meant to be an Australian? – should not go by scot free, the sloppy zooms and loud hip-hop soundtrack are no longer cute, and would be panned if done by another director. The one person that seems capable of preventing Quentin Tarantino from making Great movies is Quentin Tarantino and his belief in his own press. White folks in the 1800s who were shocked at the appearance of a free black man riding a horse is one thing. White folks who fall over each other to heap praise at a director (veering close to over-rated status) because he is ‘brave’ enough to make a schlocky exploitation style movie with more N words than 37 rap albums is quite another. Final Rating – 7 / 10. Django Unchained still has Christoph Waltz’ performance and enough other moments to recommend it, but talk of Oscars, parades and directorial Gods should be taken with a pinch of salt. To anyone who claims anything other than Pulp Fiction and Reservoir Dogs as their favourite Tarantino films, I would simply ask; why haven’t you seen Pulp Fiction or Reservoir Dogs yet? Django Unchained – like everything QT has made since 1994 – might be good, but it just isn’t in their league. Two directors burst onto the scene in the 1990s. Since then one has been excoriated for the continued drop in quality for his films The other seems universally adored and if he retired today would be judged as one of the top two or three directors of his generation. People rush to stick the boot into M Night Shyamalan with as much passion as they fawn at the feet of the ‘great’ Quentin Tarantino. I don’t fully understand either case. Reservoir Dogs was a great movie. Pulp Fiction and The Sixth Sense were game changers. So it must only be me who thinks that neither director has made a Great film in the past decade and change? If you believe the press and discussion boards Django is the best thing since anything invented with a small ‘i’ in front of it. 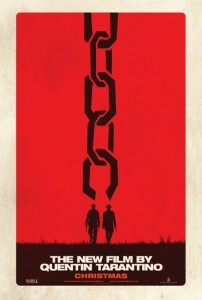 Django Unchained is just a movie – a very stylish movie – but just a movie. I don’t care how QT breathlessly sells it to the press and the late night TV hosts. I don’t care how many fanboys gush over how very brave and original it is (it isn’t). I don’t even care how many awards it gets. If this was directed by Quincy Tarantula it would simply likely enjoy momentary notoriety before blending in with the rest of the films that vanish without trace. This entry was posted in Film, Movie Reviews, Sam M-F Jackson, Superstars, Worthwhile Movies. Bookmark the permalink.